It is the semi-final and there are just four bakers left. This time it is the French round, and the challenges include savoury canapes and opera cake. It is the semi-final and there are just four bakers left. This round is the French round and the all-female semi-finalists have just three French bakes standing between them and a place in the final. The signature challenge raises the stakes, tasking the bakers to make three different types of savoury canape in just two and a half hours. One type must be choux, the second another type of pastry such as shortcrust or rough puff, and the third can be anything of their choice, from biscuits to scones to dim sum. Mary and Paul will be looking for a professional finish and with so many techniques to cram into such a short timeframe, there will be no room for mistakes. The technical challenge requires the bakers to combine techniques they have shown throughout the series, this time all packaged into a recipe for the complex charlotte royale, which combines the perfect swiss roll surrounding a delicate bavarois, set with gelatin to hold a firm dome once turned out - hopefully. The final challenge is a truly iconic French patisserie, the opera cake. Whilst Mel travels to the Paris Opera House to discover where the dessert originated, the semi-finalists battle to create the distinctive layers in their own take on the classic that will hit the right note with the judges. Impress your friends and family with this kitsch dessert. 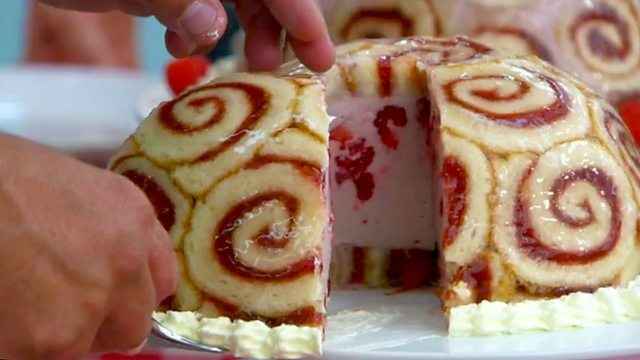 Mary Berry's Charlotte Royale is made of jam-filled Swiss roll with a set egg custard flavoured with raspberries, strawberries and raspberry liqueur. A baker's dozen of Britain's top home bakers battle it out to be crowned the best.